Doughnuts and cookies might be America's favorite sweet treats, but that doesn't mean they belong together. Life is full of really difficult decisions. But choosing between doughnuts and cookies shouldn't be one of them. 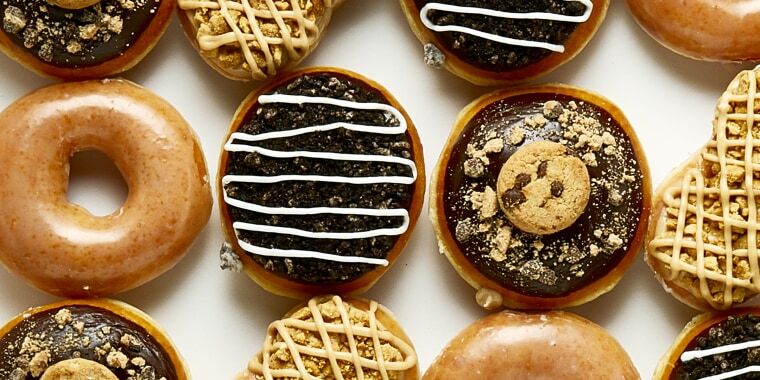 Now, you don't have to, thanks to Krispy Kreme’s three newest creations. The doughnut chain has teamed up with Nutter Butter, Chips Ahoy! and Oreo to “make each cookie an awesome doughnut experience." While each of the new doughnuts looked like an impressive counterpart to its cookie inspiration, the actual taste profile of each had TODAY tasters divided. The Nutter Butter Cookie Twist Doughnut is coated in Krispy Kreme’s signature glaze, dipped in peanut butter icing, topped with real Nutter Butter cookie pieces and drizzled with more of the peanut butter icing. Overall, this doughnut was the favorite of the trio for tasters who loved the original cookie and among those who preferred simpler doughnuts. The Chips Ahoy! Doughnut, which is filled with cookie dough Kreme and topped with melted dark chocolate and a mini Chips Ahoy! cookie reminded a few reviewers of a Boston cream pastry. “I love a good chocolate chip cookie and a tasty donut, but this combination didn't hit the sweet spot,” said one taster. Many thought this doughnut tasted the least like its original cookie inspiration and lamented that weren't more chocolate dips in the dough itself. Back by popular demand, the Oreo Cookies and Kreme doughnut is a classic yeast doughnut filled with an Oreo cookie-flavored cream, then dipped in dark chocolate icing, topped with Oreo cookie crumbles and finished off with a drizzle of icing. This mash-up was definitely a TODAY taster favorite because of all the “Oreo goodness” and the “light and not too sweet” filling packed into one little piece of fried dough. Unlike the Chips Ahoy! doughnut, this pastry had a very distinct cookies-and-cream flavor, though the chocolate wasn't sharp enough for some. However, one reviewer tasted “a weird peppery (flavor)” in the filling. The three new doughnuts are just the latest innovations in a long line of Krispy Kreme flavors inspired by a variety of sweet treats. The doughnut empire released the Oreo Cookies and Kreme Doughnut for Valentine’s Day this year in the shape of a heart. Later in February, they teamed up with Hershey’s to launch the Hershey’s Gold Doughnut, honoring the 2018 Winter Olympics. Most recently, Krispy Kreme even released a Reese's Peanut Butter Egg Doughnut for Easter. The three cookie-inspired pastries are available now at select U.S. locations. Coming up, look out for a lemon glaze doughnut, which was the winner of Krispy Kreme's fan-selected-flavor contest, being released later this spring.